As most foreigners know, working in Thailand requires a work permit, and there some job fields from which foreigners are forbidden. Most of those jobs are in the category of general labor such as shop clerk, hairdresser, taxi driver, and masonry/construction work. Other job foreigners are prohibited from are agricultural, textile production, and jewelry making. In fact Thailand considers foreigners who come to the country to attend meetings, seminars, lectures, appear in court, or even buy things for export as “working”. This can create lots of confusing for foreigner nationals. While there are restrictions on the kinds work available to foreigners in Thailand, there are plenty of jobs where foreigners are very much in demand. These jobs do require a work permit, but again as with most things in Thailand there are always exceptions. Remember foreigners ARE NOT PERMITTED TO WORK WITHOUT A VALID WORK PERMIT (There are few exceptions, see below) even for charity work. This is a picture of a temporary work permit in Thailand, inside. Those who are looking to work or who are already working in Thailand need to understand that there are 3 principal types of work permit for the country. Each kind corresponds to different fields of work as well as duration of the work. 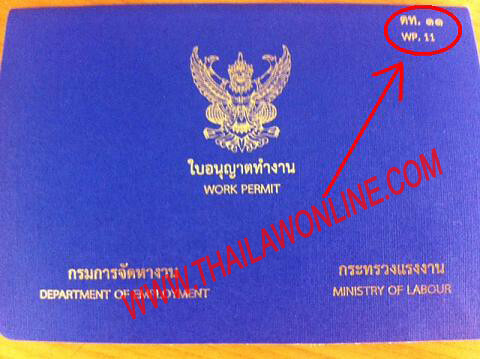 These different kinds of work permit are defined under Thailand’s Working of Aliens Act B.E. 2551, with the most commonly issued type of work permit being the WP.1 Work Permit. This is the kind of work permit most foreigners in Thailand are used to applying for and generally hold when working in Thailand. The WP.1 Work Permit is issued to foreigners deemed to be Skill Workers or Experts in specified fields, and who will be working in the Kingdom of Thailand for an extended period of time. Picture of a WP 11 work permit, for temporary work. Any foreigner who wishes to work any of the fields mentioned above will need to obtain the WP.11 Work Permit, and the application process is where most run in to trouble. But before moving on to the application process there is one last area to cover; Exceptions and Exemptions. One of the best places to start is on the web to find the necessary application forms for obtaining a work permit. The Department of Employment has Work Permit Application PDF files available for download. These are very useful even if some of the English translation is a little off. They include a list of the documents which are needed when submitting a work permit application. The departments website is wp.doe.gov.th and click on the English link at the top right of the screen, then click on “List of Documents and Forms”. This will lead to a great list of the available work permit application forms which can be downloaded and filled out. Rules and regulations regarding foreigners working in Thailand always seems to change in small ways from time to time. Staying informed about changes certainly helps people who are looking to start work in Thailand, and for those foreigners who will need to conduct some kind of business in Thailand. The “Temporary Work Permit” or WP.11 is where most changes occur. Any foreigner who needs to obtain this kind of work permit is advised to do a little research and find out the latest requirements and documentation needed in this regard.